Product prices and availability are accurate as of 2018-10-14 17:51:56 UTC and are subject to change. Any price and availability information displayed on http://www.amazon.com/ at the time of purchase will apply to the purchase of this product. Candy makers love this double boiler. Non-reactive stainless steel allows you to whisk or stir in this 2-Quart size. The quot;full capquot; base has an aluminum core for even heating and the stainless steel body offers lasting beauty.quot;Full Capquot; Base Advantage - Now a stainless steel protector surrounds a thicker aluminum core for easy maintenance and better heat distribution. Since the entire surface is stainless steel cleanup is easier. 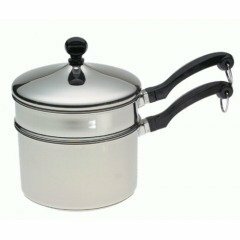 Enjoy a lifetime of beauty.Close fitting lids create a self-basting feature that protects the food`s taste and nutrients. 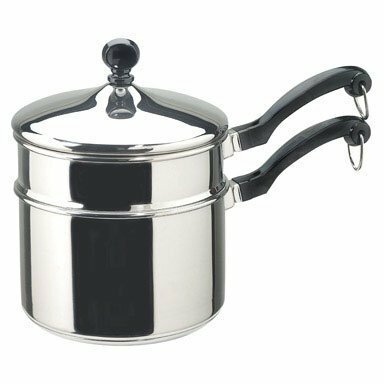 Classically styled phenolic handles are oven safe up to 350F / 180C.Durable stainless steel construction - dishwasher safeThicker rolled pan rims for extra durability enhanced drip-free pouring and easy handling.